Scientists have managed to sequence the genome of a 700,000-year-old horse—in the process generating the oldest complete DNA sequence yet. A team of researchers from the University of Copenhagen, Denmark, worked with a horse bone found in the permafrost of north-west Canada all the way back in 2003 to achieve the result. Previously, the oldest complete genome came from 110,000-year-old polar bear remains. Sequencing the genome of the 700,000-year-old horse was no simple task. Over that length of time, the DNA had degraded to such an extent that little was left to go on—which meant that the team had to develop new techniques especially. In particular, they used weighty computational techniques to rebuild the genome from many tiny scraps of data, some just 25 letters long. They also had to use clever software tricks to sift out DNA from microbes that had infested the fossil. The eventual result was a genome—published today in Nature—that the team could compare with others. 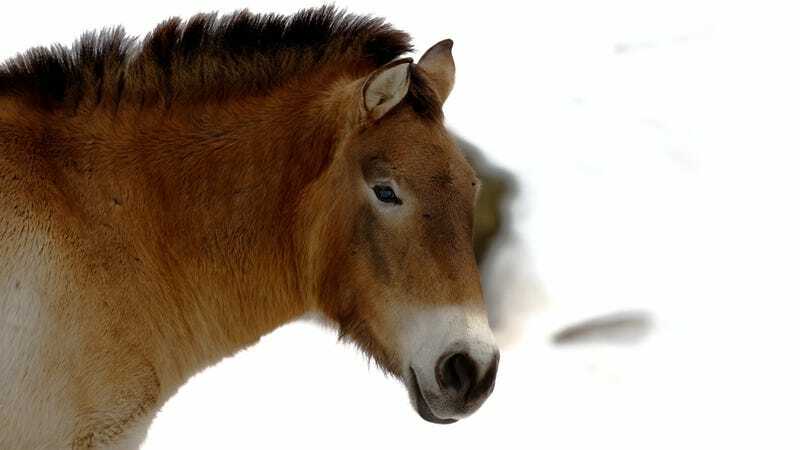 By considering Przewalski's horse (pictured above, a wild species found in Mongolia), donkeys, and other domestic breeds, the researchers have estimated that the last common ancestor across the entire Equine species lived between 4 and 4.5 million years ago—before the last ice age. That's about twice as long ago as experts previously thought.